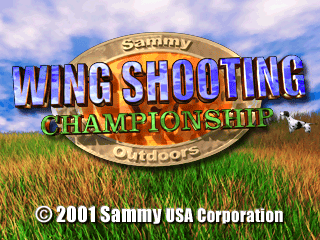 Wing Shooting Championship © 2001 American Sammy Corp.
Wing Shooting Championship is a 2 player head-to-head big game competition. The players can select from 5 weapons to hunt with : Pump Action, Semi-Automatic, Over and Under, Side by Side and Single Shot. There are 6 different bird stages: Great Plains Quail, Ring-Necked Pheasant, Canada Goose, American Black Duck, Mallard Duck, and Eastern Bob White Quail. Each bird stage has 12 areas with one bonus stage. 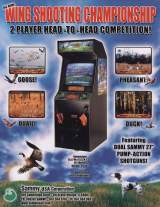 Wing Shooting Championship was released in September 2001.